DUSHANBE, Oct. 11 -- Chinese Premier Li Keqiang on Thursday called on China and Kazakhstan to further dovetail development strategies, give full play to industry capacity cooperation advantages, thereby steadily promoting existing cooperation projects and continuously exploring new areas of cooperation. Li made the remarks when meeting with Kazakh Prime Minister Bakytzhan Sagintayev, who is here to attend the 17th meeting of the Council of Heads of Government of the Shanghai Cooperation Organization. 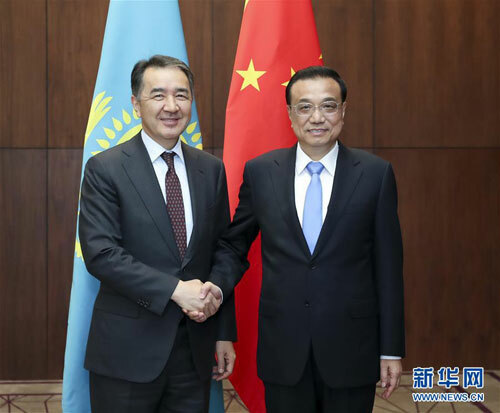 Noting that the two countries are friendly neighbors of sincerity and mutual trust as well as comprehensive strategic partners of mutual benefit and win-win cooperation, Li said both China and Kazakhstan regard each other's stability, development and revitalization as a good opportunity for their own development. Li said China stands ready to keep the momentum of high-level exchanges with Kazakhstan and expressed the hope that the two countries will enhance links of each other's ports, expand trade, jointly safeguard multilateral trade system and open world economy, so as to benefit peoples of the two countries and the region. Sagintayev said Kazakhstan stands ready to further promote synergy of development strategies with China, facilitate port upgrading, increase cargo transit volume in Kazakhstan, further expand export of agricultural products to achieve mutual benefit and win-win results.